Web personalization is the process of creating customized and tailored experiences for each visitor or for a group of visitors to optimize conversion and boost engagement. Instead of providing common and broad experience, Web personalization provides a way to present a unique experience for each unique visitor according to their need, desires, and their data. IndusInd Bank Limited is a Mumbai based Indian new generation bank, established in 1994. The bank offers commercial, transactional and electronic banking products and services. IndusInd Bank is the first among the new-generation private banks in India. IndusInd bank wants to build his visitor’s profile and target them according to their activities, what are they looking for or what they need. The goal of the IndusInd bank is to deliver a customized, personalized and interactive digital experience to each of his visitors and customers and improve their conversion rates. To achieve this goal, IndusInd bank works with NotifyVisitors. 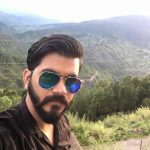 NotifyVisitors, an omnichannel marketing tool, with his great a/b testing and web personalization software, converts IndusInd bank static website into a unique and different site for each visitor, which increases customer engagement, increases sales and drive higher conversion and customer loyalty. Now, Let’s see how NotifyVisitors helps IndusInd bank create a unique and personalized website for each of his visitors and customers without changing a single code on their website. Now, who are visitors and who are customers according to IndusInd bank? Visitors are those who just visited the IndusInd bank website and customers are those who are already registered with IndusInd banking. First feel of a personalized website of IndusInd start with greetings to the customers. It says good morning, afternoon and evening according to customer’s time, with the full name of a customer. When you greet your customers and show them the uniqueness, they become more comfortable in engaging with your website and more likely to convert. IndusInd bank shows personalized messages like a festival or birthday wishes to connect with their customers more personally. it gives a message to the customers that they are not just using IndusInd bank service, they are like family to them. Through personalization, IndusInd bank shows the recommended products to their customers. This product recommendation isn’t based on assumption or just guess, instead it is based on customer behavior and their activity. Product recommendation can be based on frequently viewed, considered, or purchased with the one the customer is currently considering. Customers are more convertible if they see what they expect to see, what’s most valuable, what’s on their minds and are easily irritated when shown content they deem irrelevant. As shown below different offers demonstrated to different customers based on their last activity. Before personalization, IndusInd used to show the same offers to different customers. 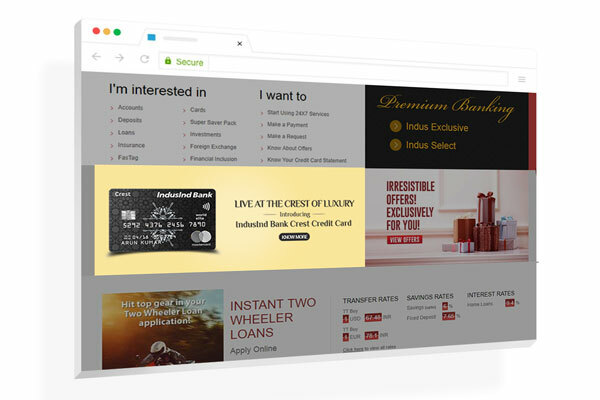 Credit card offer in the same place as a homepage for customers who searched or viewed credit card on the IndusInd website. IndusInd shows real-time targeted offers to customers. 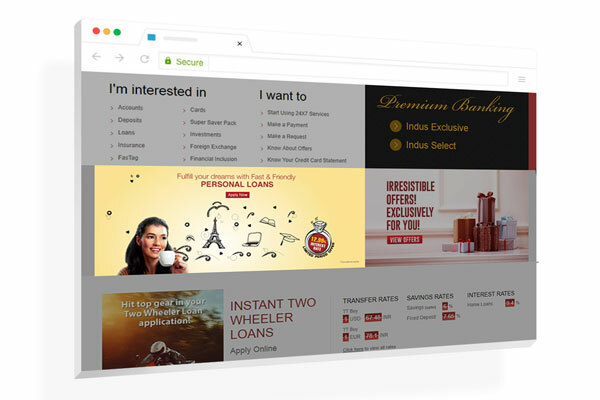 For example, as shown below in gif, the first customer clicks on a banner in which they are giving an offer on purchasing through credit card, When customer reloads that page, through personalization offer, will change, and now it shows offer of a 500 rs voucher on 5 transactions through an IndusInd card. 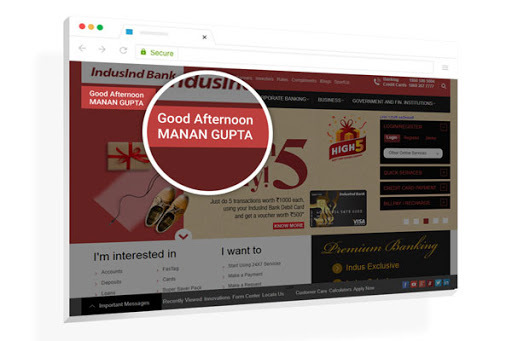 IndusInd uses NotifyVisitors sticky sidebar banner to show recommended and targeted offers to customers on the basis of their activity and behavior. To increase sales and to convert your visitors into your customers, you have to show them a right offer, in the right way at the right time. This is what IndusInd do with help of personalization They dynamically change banner with targeted offers on the basis of users last activity. As shown in images below both offers are for same visitors, when visitors visit their fixed deposit page, all sidebar banner on website changes to fixed deposit offers. 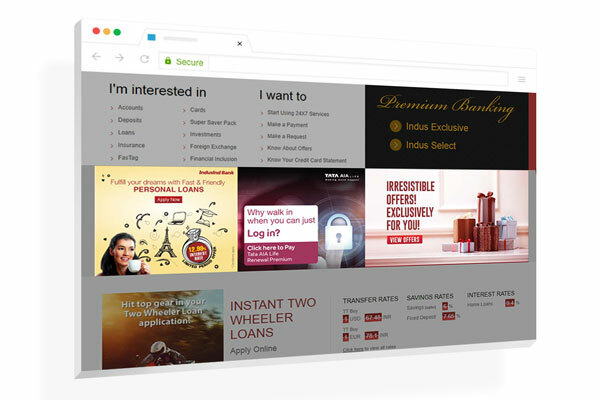 For a long time, IndusInd bank showed a common carousel to all customers with the same offers. They have the large data about what customers want, what they are looking for, what is best for customers or what they are willing to buy. But this data is meaningless without getting actionable insights from them. After personalization, IndusInd shows different carousel with different offers to different customers by using their data. When a customer clicks on an offer, it will get replaced by most recommended offers for that customers. In our next blog, we will see how all these things helped IndusInd to increase conversion and sales. Loved your article! Waiting for your next post on how personalizing the website helped IndusInd to increase conversion and sales. Thanks, bhushan for reading and commenting. Hope you are doing great.